Melissa MacMeans, a representative for the company, says, "You can count on us for the highest quality of service. While other garage door companies will employ sales people, we employ highly trained professionals who are ready to attend to your every garage door need." 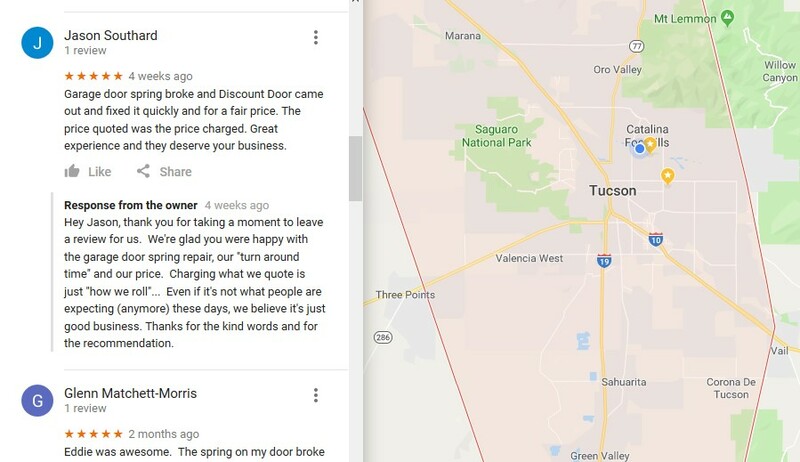 MacMeans says that they offer the best parts, workmanship and customer satisfaction in the Tucson area and states that their professional technicians never try to upsell their customers into something more expensive that they neither need nor can actively afford. She states that the company's goal is to simply provide the best service possible and to ensure that each and every customer is completely satisfied with the outcome. A recent customer left a review online stating that his garage door spring broke. He states that the company, "Came out and fixed it quickly and for a fair price. the price quoted was the price charged." MacMeans says that this is their policy. She states, "When we quote a job, that is the price that you pay. We never try to talk you into something more expensive or try to push accessories or other costs onto you that you do not need. We quote a price and we stick with that price." MacMeans says that installing a garage door needs to be done properly and can be dangerous for those who are not aware of what they are doing. She states that home and business owners should avoid injury and safety issues by contacting a professional garage door installation company as opposed to attempting to install a garage door on their own. She says that Discount Door Service has been in business for 20 years, and states that they are fully licensed and bonded and listed with the Better Business Bureau and Angie's List. The company states that they have a number of positive reviews on various sites online and urges those with garage door needs to look up those reviews to learn more about their customer satisfaction policy.